According to a report released on January 22 by the General Department of Vietnam Customs, total export earnings reached US$4.94 billion since the beginning of January, a year-on-year increase of 14.4 percent. Among the ten items with the highest turnover, mobile handsets and spare parts took the lead, fetching $737 million, followed by computers and components ($398 million), garments ($681 million) and wood products ($209 million). The Foreign Direct Investment (FDI) sector posted an export earning of $2.49 billion, up 19.5 percent over the first half of January 2012, making up nearly 60 percent of total export earnings. Like in previous months, Vietnam continued a trade surplus of $139 million in the first half of January 2013. Meanwhile, the second round of Free Trade Agreement (FTA) negotiations between Vietnam and EU began in Brussels, Belgium, on January 22. The four-day discussions will be focused on exchange of goods and services, investment, intellectual property, labor, and the environment, among others. After the success of the first round, the second round is expected to speed up bilateral negotiations as agreed upon by top leaders of the two sides. The Vietnamese delegation is led by Tran Quoc Khanh, Deputy Minister of Industry and Trade, and the EU delegation is headed by Mauro Petriccone, Director for Asia and Latin America at the Directorate for Trade of the European Commission. The EU is Vietnam’s largest export market, consuming $20.3 billion worth of Vietnamese goods in 2012. Once the FTA is signed, it will help promote trade and investment cooperation between Vietnam and the EU, bringing practical benefits to both business communities and people. 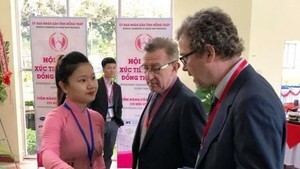 Vietnam and the UK alone have agreed to increase all-round cooperation, especially in trade, maritime navigation, finance-banking, and education, aiming to raise bilateral trade to $4 billion this year.